I have to thank Sadie’s Nest and Mummyflowers for this nomination. They were kind enough to nominate me over a week ago and I am finally getting around to posting this. 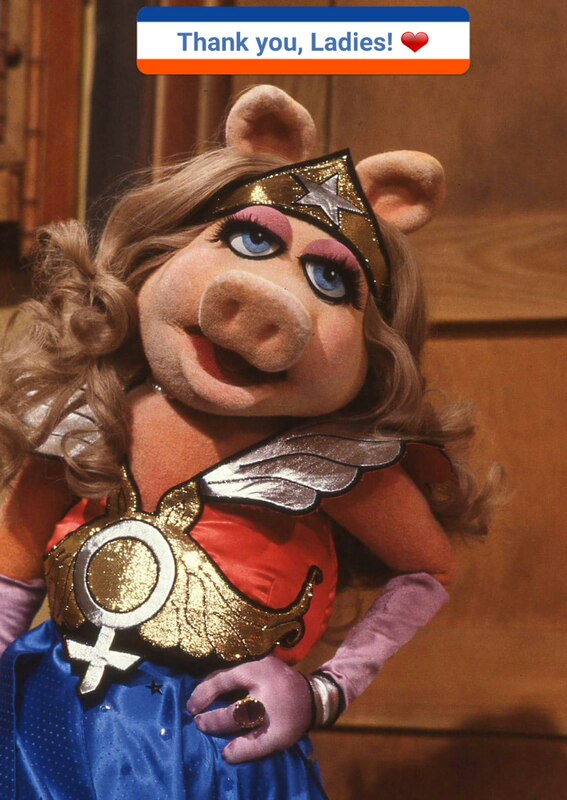 I am thanking you with a photo of Miss Piggy…a true heroine of mine and a real woman haha! 1. What is your favorite activity (aside from blogging)? Reading cookbooks or watching a movie! Love our Bluray player! 2. Who is your biggest blogging inspiration? My mother and all of the interesting blogs I follow. 3. Is there a dish you are intimidated to try to make? I think it would have to be mousse. I think I would love to see Norway. 6. If you had 1 more hour in a day, how would you use it? This sounds pathetic but I would probably sleep! 7. For traveling do you prefer boat, plane, train or automobile? Tough to answer! Each one has its good points as well as its drawbacks. I really do hate airports though! 8. Skiing in the Alps or bumming it on the beach? I would go to the Alps and play in the snow. I am not a beach bum in any way! I roast like a chicken in the oven. I hate that! 9. Have you ever done karaoke? Yes…and was not too keen on it haha.Once was enough. 10. What’s your favorite form of pampering? 1.Who is your absolute couldn’t live without best friend? My parents and husband. And my food processor hahaha! 2.What did you last buy? Votive candles. Love the effect when I light them in the house. 3. What is the biggest lie you ever told? I had to take a four hours off of work so I could go to a wedding. The wedding was on a Friday evening and was in Madrid. I was living in Málaga, which is about 3 hours away by train.I knew my boss would never let me take the time off. She was a bit of a control freak. (I am being very polite in my description of her.) I made up this story that it was a wedding of one of my closest friends, that I could not miss it and promised to make up for the hours that I requested off. (I made those hours up in my free time of course) In reality, I was going to a wedding with a friend who was finally introducing me to a man that she told me I had to meet. He and I had been exchanging emails for a few months and I had a feeling that this person was going to be important. I ended up marrying that man. 5. If you could tell someone that you are proud of them, who would it be and why? My father. He left Germany when he was 25 and moved to Montreal. He spoke no French or English but learned both. Pretty brave. 6. What is your favourite guilty pleasure TV show? The majority of programs on Spanish television are pathetic. I don’t watch television. I love Agatha Christie’s Hercules Poirot series though! I have the dvd collection! What is the most charitable thing you have ever done? When I think of practicing charity, I think of practicing patience. Keeping your mouth shut when you really want to tell someone off. Giving a person the benefit of the doubt I don’t do big things. Just small things but those small things seem to be the hardest things to do. Do you have tip to other bloggers? Not necessarily a blogging tip, but absolutely anything! Weirdest thing you have ever eaten. I have 7 nominees. I know I am supposed to noninate 10 but I have been nominating lots of blogs lately! Some of these ladies will not respond to this nomination because they have been nominated TONS of times by other bloggers. I am nominating them so other bloggers can check them out! 1. What was your favourite book as a child? 5. What food do you recommend everyone should try? 10. Do you have a pet? If not, would you like one? Thank you again to the ladies who nominated me.